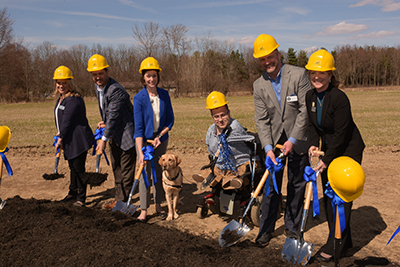 On April 3, 3019 Canine Companions® broke ground on their new state-of-the-art campus for the North Central Region in New Albany, OH. The celebration was attended by over 175 friends, supporters, volunteer puppy raisers, recipients, and staff from around the country. “As we embark on our strategic plan, we are looking at a lot of ways to innovate, a lot way to get more dogs to more clients; and this region will now become critical to that. Not only because it will be state-of-the-art and it will be able to house some of the pilots and new things we want to try, but because it has a tenured staff and a really innovative staff. The North Central Region is a huge part of what comes next, not just in the shiny new building, but in the thinking and in the way we try new things and the way we do more to fulfill our mission,” shared Canine Companions CEO, Paige Mazzoni . This new 16+ acre, state-of-the-art campus, will allow Canine Companions to serve more teams than ever before. It will provide our North Central Region with on campus guest rooms for recipients coming to be matched with their new four-legged partners, community space, training space and an enhanced kennel for their dogs. Although this new campus is just beginning to take form, Canine Companions is already looking towards move in day, scheduled for the end of 2020 and the countless people’s lives they will be able to impact. Click here to learn more about how you can get involved.